John S. and James L. Knight believed that a well-informed community could best determine its own true interests and was essential to a well-functioning representative democracy. The brothers pursued those beliefs, building and running one of the largest and most commercially successful newspaper companies in America in the 20th century; they were known for their journalistic principles and openness to evolving technology. The Knights also formed Knight Foundation. In the words of James L. Knight, their foundation was to promote excellence in journalism and the success of the communities in which they worked, and they were not otherwise prescriptive. Decades after the demise of both brothers, the company was sold but their foundation remains. Like their newspaper company, the foundation has evolved over time and continues to do so. This flexibility is intentional; as John S. Knight wrote, “a truly effective foundation should have freedom to exercise its best judgment as required by the times and conditions under which they live.” What remains constant is Knight Foundation’s commitment to informing and bettering our communities. This is a statement of our core beliefs, our approach to our mission and our statement of the strategic direction of our work. It is not cast in stone. Like the Knight brothers, we believe their foundation should evolve with time, society and technology, while always focusing on ways to make relevant their passion for informing and engaging communities. We believe in freedom of expression and in the values expressed in the First Amendment to the Constitution of the United States. 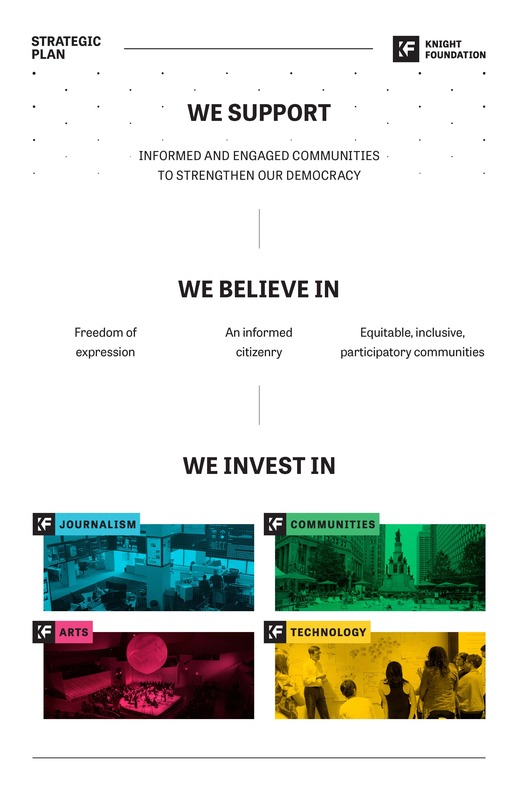 We believe an informed citizenry is essential for individuals and communities to make their own best choices and that journalism has a critical role to play in that democratic process. Impact: We seek ideas, leaders and initiatives that will have impact; transformational change begins with things as they are and requires leadership that has vision, courage, know-how and tenacity. Opportunity: We seek the best opportunities to improve or advance informed and engaged communities and will partner with people and organizations who share our values and goals; we do not fund generally. Focus: We concentrate grants and other resources in the field of journalism, and in the communities where the Knight brothers once worked. Innovation: We support grantees and partners who identify and experiment with new solutions and technology. When these ideas show promise, we reinvest in their success. Learning: We seek to understand and share insights from our work. Equity and Inclusion: We seek an equitable society which provides opportunity and is intentionally inclusive. Respect: We treat all with respect and conduct our business with the highest ethical standards. Knight Foundation supports free expression and excellence in journalism for the purpose of promoting informed communities that may better determine their own interests. We support ideas, leaders and initiatives that seek to meet the needs of an evolving practice of journalism, including the use and adoption of new media technology. We define journalism as the full, accurate, contextual search for truth, through both reporting and commentary. We seek to enable sustainable news organizations, primarily by supporting the relevance of their journalism to audiences. First Amendment: We champion a broad interpretation of the First Amendment in the digital age. We fund research, training and litigation in support of the people’s right of expression, public access to information and journalists’ right to practice their craft. Journalistic Excellence: We support the transformation of news organizations and institutions committed to meeting the demands of the digital age. We support innovative approaches to the use of technology to advance the practice of journalism and inform community. Knight Foundation supports informed and engaged communities by identifying and working with partners to help our cities attract and nurture talent, promote economic opportunity and foster civic engagement. Attract and Nurture Talent: by supporting and networking diverse leaders from all sectors. Enhance Opportunity: by building inclusive pathways to economic opportunity. Foster Civic Engagement: by enabling people to contribute to – and take an active part in – the life of their community, in a manner that is equitable and inclusive. Knight Foundation works with partners who create or present art that engages, educates and delights residents in ways that reflect the rich diversity and identity of each community. We endeavor to make art general in Knight communities by funding anchor institutions seeking wider audiences and by supporting grassroots initiatives of individual artists and organizations. This two-pronged approach and our focus on specific communities increase the impact of our work. We are open to change and support the adoption of evolving technology to advance our core beliefs. Knight Foundation identifies, explores and invests in innovative technology approaches and applications with the greatest potential to advance the fields in which we work. Technology is a part of all our grant-making and social investment programs. This requires collaboration among programs to examine core technology issues that cut across the foundation’s work, and to discover and implement program solutions. Knight Foundation also supports innovative experiments in the use of digital media and technology to inform. We then reinvest in the most promising projects that emerge from early-stage grants. Context: We develop research that provides a clear understanding of the fields in which we seek to have impact and the forces that affect them. Discussion: We create spaces for staff, grantees and other partners to have open and challenging dialogue to drive learning. Evaluation: We work with staff, grantees and other partners to assess and share the impact of the foundation’s work. These assessments inform future grant-making. Communications: We seek the widest distribution of information and understanding about our work to attract the best ideas, build networks of thinkers and leaders, and promote positive change. Administration: Carrying out our work requires a nimble structure and a high-performing, agile, competent and open-minded staff. Finance: We promote efficient and effective financial operations, ensure a culture of regulatory compliance and accuracy, maintain relations with outside legal and investment counsel, and manage direct investments in mission-aligned companies. Knight grants and initiatives are developed and informed by a consultative process that includes financial, business and management considerations. Information Technology: We require the efficient and effective use of technology systems and tools to support the foundation’s mission and operations. Information technology is an integral part of all staff functions and an essential platform for engaging with grantees, peer foundations and other partners. Philosophy, broadly construed, is the love of wisdom. In application, it is the science which investigates general facts and principles of reality and of human nature and conduct. As it pertains to journalism, philosophy embraces the general principles in a speciﬁc ﬁeld of knowledge and dedication to a particular system of ethics. 1. The Knight newspapers strive to meet the highest standards of journalism. We try to keep our news columns factual and unbiased, reserving our opinions for the editorial pages, where they belong. 2. Knight newspapers have no entangling alliances. We are not beholden to any political party, faction or special interest. Our editors and ofﬁcers studiously avoid conﬂicts of interest. I and my associates serve on no corporate boards or committees other than appropriate civic organizations or committees in the ﬁelds of education and communications. 3. It is our publishing judgment that business and general managers should conduct the managerial functions of our newspaper group; that the editors are responsible for the news, feature and editorial quality. For newspapermen come in many molds. Some are distinguished editors, writers and photographers, others are superlative salesmen, talented circulation men and efﬁcient production experts. Still others, but not so many, have the genius of general management -- sometimes described by Jim Knight as the “nuts and bolts” department. Working as a team, the aforementioned and their co-workers accomplish the daily miracle of turning raw newsprint into the printed product which is sold and distributed in every 24-hour cycle of the year. 4. We believe in proﬁtability and its achievement through efﬁcient production and modern business procedures. But we do not sacriﬁce the quality of our newspapers on the altar of the counting house. The “unpopular” stands taken by newspapers are often the reasons for their preeminence in the ﬁeld of journalism. The truly distinguished newspapers in this country are those which have dared to face public wrath and displeasure. We endeavor to be diligent in the areas of general management, future planning and in holding high the torch of vigilant, independent journalism. As responsible purveyors of information and opinion, we are committed to the philosophy that journalism is likewise a public trust, an institution which serves, protects and advances the public welfare. The Knight newspapers have a deep and abiding faith in our rich heritage of precious freedoms which can be preserved only to the degree that the public is at all times fully informed of the forces which seek to destroy them. Few things are impossible to diligence, understanding and skill. Thus we seek to bestir the people into an awareness of their own condition, provide inspiration for their thoughts and rouse them to pursue their true interests.